I had noticed the peculiar lobed galaxy NGC 5945 on a sky survey plate a while ago and thought I would attempt it sometime. Whenever I select a target I usually do a search on Google images first to see what results other imagers have already obtained. Very few images of NGC 5945 turned up so it seemed obvious that it wasn't an easy object especially in capturing its distinctive lobes. When the run of clear nights continued with a noticeably more transparent sky than the preceding two had been I thought it worth a try. I managed to obtain 18 subs before the usual post meridian guiding problems arose but the transparency wasn't as good as it first appeared and they were a bit variable. Despite pushing the processing very hard the lobes escaped me and confirmed it would require some excellent transparency and deeper subs to stand any chance of capturing them. 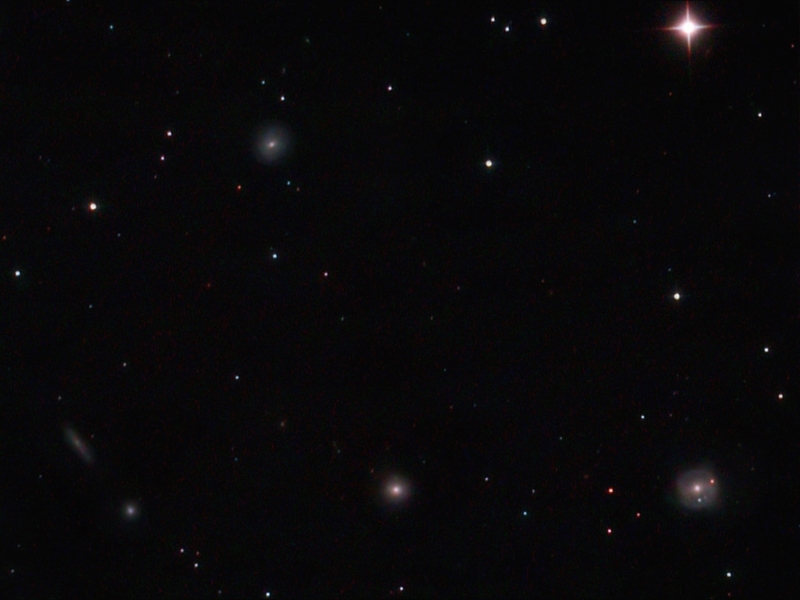 NGC 5945 lies amid a rich field of galaxies in Bootes. Left to right these are UGC 09873, PGC 055238, NGC 5947, NGC 5943 with NGC 5945 lower right. Details: 10" f4.3 Newt. 18x 10minute exposures @ iso1600 with CLS in DSS, FIV, CS2 & XAT.